A native plant with many garden merits. 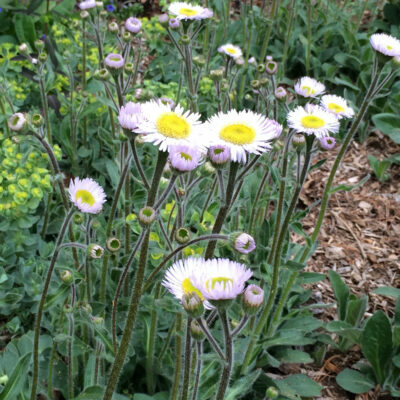 Large daisy-like, silvery light lavender, almost white flowers bloom in spring over a dense carpet of big fuzzy leaves. After flowering occurs, cut down flower stalks and you have a very attractive, weed-blocking groundcover. Full-part shade. Drought and deer tolerant. Height 12″ in flower, 4-6″ as a groundcover. Zones 5-8.